Your favorite Dunkin Donuts brand fresh K-Cups shipped to your home! 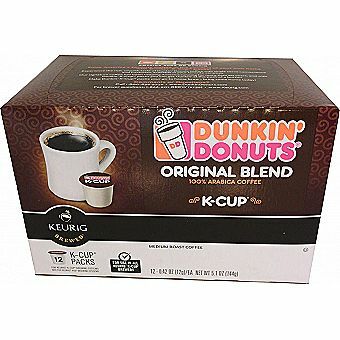 Dunkin Donuts K-Cups - One Box of 12 K-Cups fresh and shipped quickly. Many Flavors available. Click here to see all of the Dunkin Donuts K-Cups flavors available. Once you've had a Dunkin Donuts K-Cups, you will remember it! Dunkin Donuts K-cups have a distinct taste and come in a variety of flavors that allow for a unique and customized experience each and every time. Dunkin Donuts K-Cups allow you to enjoy that same great taste and flavor in the comfort of your own home or office using the Keurig® K-Cup® brewing system. Dunkin Donuts K-Cups have classic flavors like Original, Dark Roast and Decaf which are joined by Hazlenut and French Vanilla flavors and supercharged with seasonal flavors such as Peppermint Mocha and Pumpkin Spice. Each box contains 12 cups so whether you're enjoying a cup of iced coffee by the pool or a mug of hot cholcate by the fire, Dunkin Donuts K-Cups are sure to add some flavor to your life year round.